The design "was intrinsically linked," author Des Brennan avers, "with the wars in Vietnam". 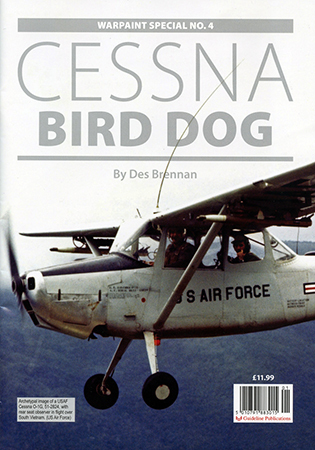 It's the Cessna Bird Dog. And now it's subject of Brennan's lavishly illustrated "Warpaint Special No. 4" from Guideline Publications. L-19s and O-1s, the 66-page handbook recaps worldwide iterations and schemes for the iconic Indochina wars combatant. Design and development. Colors and markings. Inside and out. Building Roden's 1:48 Bird Dog? Or Model USA's ancient effort? How about Airfix's 1:72 classic? Color-packed contents include dozens of color photos. Eight pages of color plates – profile, plan, and inset illustrations – survey Bird Dog warpaint. And 12 pages of close-up shots and two pages of 1:48-scale plans provide plenty for detail connoisseurs. How about those underwing Mk.4A stores rack and FFAR images on pages 52 and 53? Coverage concludes with a two-page spread listing Bird Dog kits, decals, and accessories. And a box therein summarizes aircraft serials, dimensions, and performance. But the M1 Garand was a self-loading, semi-automatic rifle – not a bolt-action weapon. And why no illustration of the French "five-railed rack under each wing" for both smoke and high-explosive close-support rockets? But I nitpick. Grab this great little handbook for your next Bird Dog project. My sincere thanks to Guideline Publications for this review sample!